We’ve received a lovely dose of frigid weather this week, and it has us craving hearty, hot meals. This dish is perfect cold weather comfort food–hot, hearty, nourishing and healthy. I wouldn’t normally associate a vegan stew with stick-to-your-ribs winter fare, but this fits the bill and is on our list of make again meals. 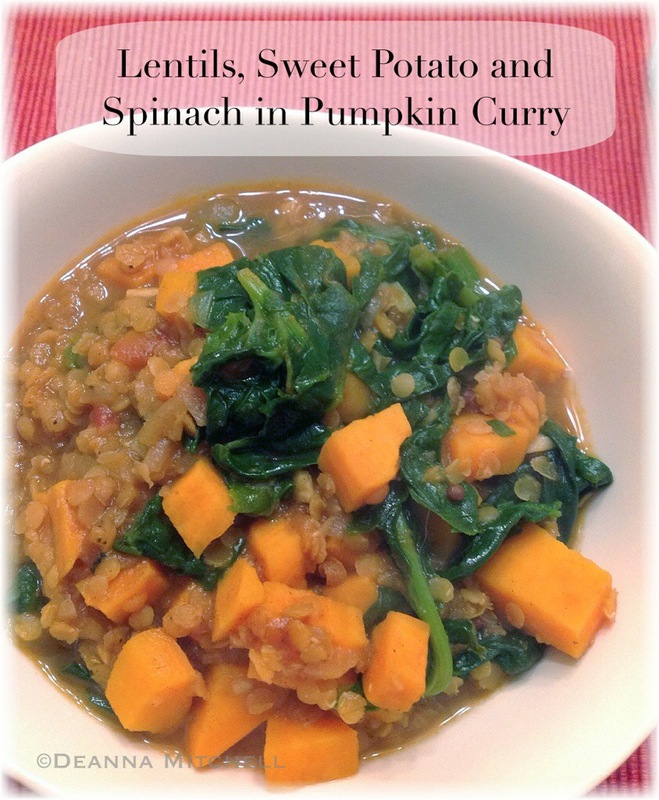 The combination of pumpkin, spices and coconut milk makes a rich base for red lentils, flavorful sweet potatoes and fresh spinach. You could thin this out a bit and serve it as a soup, but we prefer it thick like a stew. You could also substitute butternut squash for the sweet potatoes and chard or kale for the spinach. Don’t let the long list of ingredients keep you from trying this. Most of the list is spices and the whole dish comes together very easily in one pan! A note about red lentils: Red lentils are smaller than other varieties and will dissolve into a sauce if cooked for long periods of time. If you use a larger, thicker variety of lentil, adjust your cooking time accordingly. Mix the first 10 ingredients together in a bowl and set aside. In a deep skillet, heat the coconut oil over medium heat. Add the onions and sauté until soft and translucent, about 4 minutes. Add the garlic and ginger and sauté 1 minute. Add the sweet potatoes to the pan and stir well, coating the potatoes with the oil. Pour the pumpkin curry mixture over the potatoes, stir well and reduce heat to medium low. If the sauce is too thick, add 1/2 cup water and stir. Cover the pan and simmer the potatoes for 10 minutes, stirring frequently and adding water if needed to keep the sauce from sticking. Add the lentils, cover and cook 15 minutes, stirring frequently. Add the spinach and cook another 5 minutes or until the lentils are soft, but not dissolved, and spinach is wilted. Check for seasoning and adjust as necessary for your palate. This recipe looks delicious and will try it out in the next few days as the weather has turned rather cold in these necks of the woods!! !